Hollywood celebrities have completely lost their grip on sanity. Donald Trump has caused them to openly fantasize about presidential assassinations and acts of terror against the White House. But one conservative actor broke ranks from his unglued cohorts and offered one unifying message. Perhaps Donald Trump’s greatest attribute is his superpower to force leftists to expose themselves as hypocrites. Their hatred of Trump is so visceral, they automatically oppose anything he says or does. This binary thinking leads leftists to violate their supposed principles, and take irrational and nonsensical positions. For example, leftists swore Trump could entangle the United States in a nuclear war. Instead, Trump built a tenuous but working relationship with North Korean dictator Kim Jong Un. The left criticized Trump’s peace talk overtures, instead seemingly preferring bellicose relations with a nuclear state. Trump announced he was withdrawing American troops from Syria and Afghanistan, and suddenly the left turned into staunch war hawks. Actress and 1960s flower child Mia Farrow railed against Trump because he wanted to end U.S. intervention. Such illogic is sadly too common in Hollywood. For example, actress Debra Messing vehemently opposed Donald Trump’s tax cuts but complained when the top tax bracket slightly increased. These leftists have no principles. They only believe in oppositism. While Hollywood celebrities afflicted with Trump Derangement Syndrome fulminate on a daily basis, conservative actors like James Woods and Jon Voight push against the leftists’ toxic narrative. And they do it at a cost because leftists are vicious. Woods lost his agent because of his outspoken views. 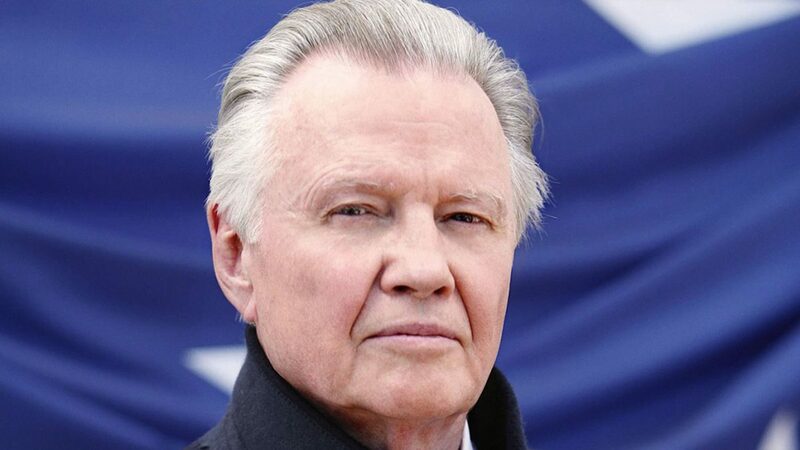 Voight will play a role in the upcoming “Roe v. Wade” film, and because it has a pro-life slant, the set has literally been attacked by left-wing activists. Other established conservatives have shared similar experiences about agents and gigs they’ve lost. But it’s not just happening to people at the top. In 2008, Proposition 8 – a ban on gay marriage — passed in the state of California. Gay activists actually hunted down people who contributed to the Prop 8 campaign and attempted to ruin them. A local cashier lost her job after activists exposed her as being in favor of traditional marriage. This is the type of political climate conservatives are dealing with, and it doesn’t ramp down for the holidays. Leftists often mangle the Christmas story and the Nativity scene to fit their pro-illegal immigration agenda. However, Voight chose to use the Christmas season to spread positivity and unity instead of rancor and division. Hollywood is great at creating entertainment, but they’re equally great at creating chaos. And with the industry so heavily tilted in favor of the left — Donald Trump’s campaign received only 1% of the donations Hillary Clinton’s campaign received from Hollywood in 2016 – the chaos is always pointed at conservatives. It’s also reflected in the news coverage. A study showed 92% of network coverage of Donald Trump is negative. With so much negativity in the ether, Jon Voight’s Christmas message was a breath of fresh air.